Uruguay's Copa America success last year was no fluke. They have a wealth of attacking talent that includes the likes of Edinson Cavani, Diego Forlan and Luis Suarez. 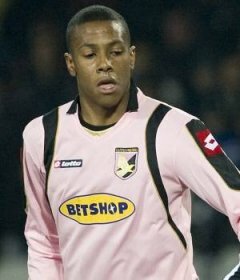 But spare a thought for Abel Hernandez, as Palermo's striker finds his international opportunities limited and that is not quite right as the former Penarol frontman is a very special player. 21-year-old Hernandez made the move abroad to Palermo in 2009, and the Italian side built a future striking partnership alongside his international team mate Edinson Cavani. Cavani took all of the plaudits and eventually completed a move to Napoli. Now, Hernandez enjoys a wonderful working partnership with veteran striker Fabrizio Miccoli who acts as a mentor for his team mate. Then, the departure of Javier Pastore to Paris St Germain saw the end of the "magic trio" at Palermo, but this year Hernandez continues to show signs that he will be a world class player for many years to come. The question that remains is if Palermo can manage to keep hold of their hot prospect. At the age of 17, Hernandez burst onto the scene with his first club Central Espanol. Very quickly, Uruguayan giants Palermo recognised his huge talent, and acquired him for a nominal fee. After just eight games with Penarol, the player completed a surprise move to Italy to link up with international team mate Edinson Cavani. It has taken some time for the 6 foot 1 striker to adjust to the rigours of Serie A football. His first full season with Palermo saw the striker grab 7 goals in 21 games, a fair showing for the teenager, whilst his second season proved very difficult as he found the net just three times in 22 appearances. This year, and after a summer of hard work and training, Hernandez has been showing why Palermo rate him so highly. 3 goals in 9 games is a fair return from the spirited frontman. As previously mentioned, on the international stage Hernandez's opportunities have been somewhat limited due to the wealth of attacking talent Uruguay have on display. But the prospect of a Suarez, Cavani and Hernandez attacking trio is mouthwatering, these three are expected to be very important players for the future success of the national team. The player, nicknamed "La Joya", has attracted some interest from abroad, too. Tottenham and Arsenal have both been linked with moves for the striker, with Spurs reportedly having an offer rejected by his club last summer. AC Milan are also long term admirers of Hernandez, but are waiting for the right time before they will make a move. Palermo are expected to eventually part ways with the striker, as there are some suggestions that the player could be worth as much as 20 million Euros already. Hernandez is a very quick and agile striker. His playing style is very similar to that of Arsenal legend Thierry Henry, as he likes to cut inside with runs from either flank. He is also a very unselfish player, as he has proved with 5 assists to his name at the time of writing. Hernandez is also tall at 6 foot 1. That gives him considerable strength in the penalty area, but he still does need to work on his heading in front of goal, which has let him down occasionally. His shooting is exceptional though, and this part of his game is what makes him a very special player. Expect to hear more about Abel over the coming seasons, whether or not that will be with Palermo or a European major club is entirely up to the player himself, and how well he progresses.